Factoid # 81. Grammar schools were present in Upper Canada for more than a half century before the first one was formed in Richmond. Initially the schools were intended to prepare young boys for careers in the ministry (Anglican), law, medicine, and later for admittance to university. The basic curriculum consisted of the classics: Greek and Latin, as well as Euclid geometry, algebra, and English. Each school could be distinctive and the curriculum adjusted to meet the needs of its community or the skills of the instructors. Usually grammar school students were the same age as modern day high school students but in a few cases, students as young as 8 were included. In that case arithmetic, spelling and reading were added to the curriculum. Girls were usually excluded from grammar schools as they were also excluded from the ministry, university and the professions. In some communities the trustees did permit girls to enroll but if this occurred the curriculum was adjusted to include French and the girls were excluded from other courses such as higher mathematics or Greek. What was more common was that girls’ schools were opened where the “young ladies” were taught some combination of English, French, arithmetic, music, art and handicrafts. So in general there was no one formula for post elementary schools in general and grammar schools in particular. However, by the 1850s, grammar schools were becoming under increased provincial control and standardization. In the early 1850s an explosion of school construction hit Carleton County including Goulbourn Township. As well as more common schools, the government decided to establish a grammar school in Richmond. The school was to serve not only Richmond students but also those from Goulbourn and nearby portions of Nepean and Marlborough Townships. In 1854, the government appointed Thomas Garland, James Henderson, and James Shillington as trustees of the Richmond Grammar School. The trustees oversaw the building of a school and recruitment of a teacher. 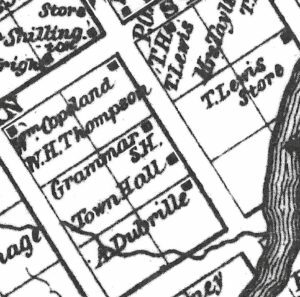 It appears that in the early 1850s, both the new municipal government and grammar school were built on the west side of Lennox St. between Strachan St. and the Jock River. The first teacher was a highly qualified Irishman from Belfast, John Boland Finlay PhD. Mr. Finlay’s tenure was short but his hiring set a standard by which to measure future teachers. Local superintendents of schools, first Rev. John Flood M.A. and then Rev. Charles Biggar Pettit M.A. (both Anglican ministers) oversaw and reported on the quality of teaching and adherence to the curriculum. Richmond children no longer had to leave home to acquire a higher level of education. Edward Rielly who built the Rielly House Hotel across from the arena came to Richmond with an interesting history. The following is a summary of Mr. McElroy’s story. “As a footloose young man in Ireland, his (Rielly’s) main interests were horses, pretty colleens and having a good time. According to all reports he was a handsome man with a lively wit and gift of the gab. He was also famous for his singing and yarn spinning but, darlin’ man that he was, he had a full share of human failings. He was bone idle, liked to gamble, seldom had any money and, in all of his first twenty years of life, had never been able to settle down to a steady job or one woman.” One day he won a claiming race. He took his winnings and sailed to New York. After his money ran out he wandered around working as a coachman, groom, teamster and stableman. His wandering landed him in Philemon Wright’s settlement where he found a job as teamster. He bought a series of horses and finally acquired one that won many races for him. One day he took his horse to a race meeting at Bell’s Cross (Bell’s Corners). “Bell’s Cross was named after Hugh Bell, a hotel man and land owner who was one of the wealthiest and most influential men in the district. But over and above all of Mr. Bell’s worldly possessions, what he prized most was Sarah, his beautiful sixteen-year-old daughter.” Rielly’s horse won the race. Sarah presented the winner’s purse and Rielly fell madly in love. Rielly started hanging around Bell’s Hotel but the totally unacceptable young man was kept far away from Sarah. “The beautiful young thing was as carefully guarded and chaperoned as a fairytale princess locked in a castle.””Rielly’s opportunity came when Hugh Bell’s prize Belgian stallion ran amuck and started to kick the stable to matchwood. The horse’s handlers fled for fear of their lives.” Rielly stepped in and quieted the stallion. The elated Bell hired Rielly to be in charge of his stables. “One of Rielly’s new duties was to act as the Bell family’s coachman and this, he was overjoyed to learn, included driving Miss Sarah to and from Bytown, where she attended school. Predictably, Miss Sarah was soon hooked on Rielly’s blarney and other blandishments and he lost no time in telling her that he loved her dearly and wanted her to become his wife.” She accepted but knowing her father wouldn’t agree, the two eloped. Rielly hitched his prize racehorse to a buggy and the two headed for Perth. When Hugh Bell realized what was happening, he raised a hue and cry, and offered a substantial reward for stopping the pair. A posse gave chase but soon the heavy workhorses began dropping out. Rielly kept pushing his fine ace horse but eventually it dropped dead. The two lovers arrived in Perth horseless and penniless but soon married. Eventually Hugh Bell accepted Rielly into the family and gave the couple a 400 acre farm near Richmond and helped Edward to get started in the hotel business. The full story is an example of Irish Ottawa Valley story telling at its finest. Factoid #84. In the 1850s a major improvement came to the village. Richmond was joined to Bell’s Corners and points east by a “macadamized” road. A Scottish engineer, John McAdam, had pioneered this type of road construction in the early nineteenth century. It was a road with a firm well-packed sub layer of heavy stone (granite was preferred) to support big loads and a top layer of light stone to allow drainage and absorb the wear and tear of traffic. In other words this is what what we might call a gravel road. The Richmond and Nepean Road Company was a private company and made its first declaration in April 1852. The nine miles of road were a massive upgrade over the old trail. At Bell’s Corners it met another existing macadamized road and provided quick access to Bytown. This was especially important for Goulbourn and Richmond farmers and merchants who relied on sales at the Bytown markets. Factoid #85. To pay for the construction and maintenance of the new macadamized road, and to provide a return to investors, the Bytown and Nepean Road Company established 2 tollbooths. Driving from Richmond, one encountered the first toll at the curve east of what today is Eagleson Road. The second toll was at the big curve entering the Stoney ​Swamp, east of Fallowfield Hill. Depending on one’s destination the charge was a few pennies. The toll keeper provided the traveler with a note saying whether the fee covered one or both tolls. This entry was posted in churches, education, Events, government, industry. Bookmark the permalink. Further to Marion’s Factoid #84 and the Richmond & Nepean Road Company making its first declaration in April 1852, by 1861 the company had issued its 11th Report of general annual meetings of the Bytown and Nepean Road Co., U. C., as published in the Ottawa Citizen of 14th December 1861 with financial details.. So did the Richmond & Nepean MacAdamized Road Company become part of the Bytown and Nepean Co.? If so when did this occur?